Which contracts are covered in Volume I? Volume I covers all 8 of the AIR CRE lease contracts, 3 sublease contracts and 15 lease-related addenda. This volume provides both a legal and transactional perspective of the AIR CRE Contracts offering concrete ideas that can be applied to your next real estate transaction. This manual will help you add value to the negotiation process and achieve better results for you and your clients. Which contracts are covered in Volume II? Volume II covers all 3 of the AIR CRE purchase contracts as well as 8 additional purchase-related contracts, 4 listing contracts and 1 amendment form. All of the contracts are explained, paragraph-by-paragraph in easy to understand language. How are the manuals organized? 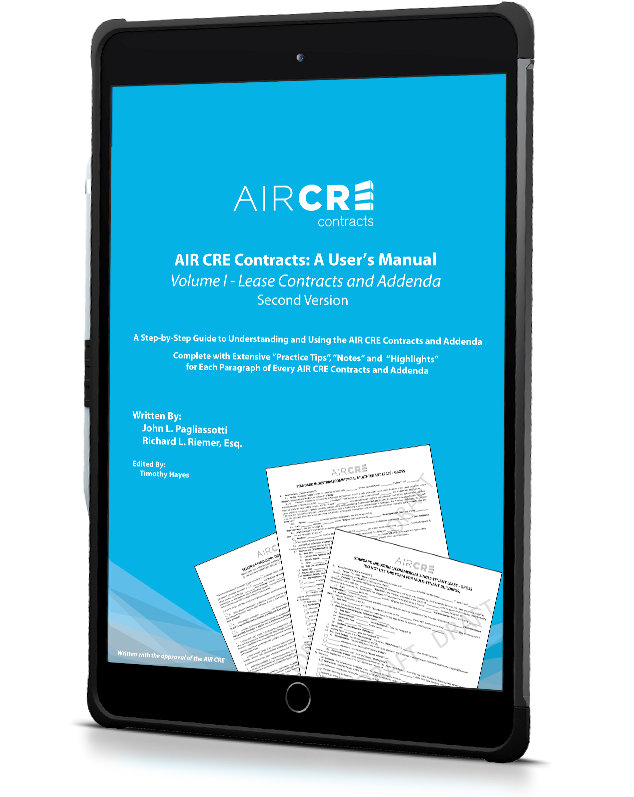 The manuals are organized to provide a step-by-step guide for understanding and using the AIR CRE's Contracts. All paragraphs of every contract are fully explained in easy-to-understand language by making use of Highlights that summarize lengthier paragraphs in everyday language, Notes that explain the concepts of the more complex language and Practice Tips that provide practical advice for landlords, tenants, buyer, sellers, brokers and all other commercial real estate professionals who make use of AIR CRE Contracts. How do I purchase the AIR CRE Contracts software? If you are interested in purchasing the AIR CRE Contracts software please call 877-462-4732.